If you are constantly assaulted by annoying commercial advertisements, you should check whether you have LuckyShopper on your computer. It is a potentially unwanted adware application that has been created to generate financial profit to for its developers. LuckyShopper helps its creators to make money via pay-per-click system while users click on the ads. The problem is that you could be redirected to dangerous websites by clicking these ads, so in order to protect your computer from potential exploitation you have to remove LuckyShopper at once. Please check out the instructions below for manual removal. This message makes it seem that LuckyShopper is a useful application that will help you purchase your most favorite goods at the lowest price. However, we have seen tons of similar applications before. All of them were based on the JustPlugIt engine, and LuckyShopper is no exception. According to our research, it is a new version of a semi-random name adware, so in a sense the program is very similar to BuyNsave, DealPlug, Dealwithapp, and many other similar applications. The only reason they enter your computer is money. Although LuckyShopper does not try to trick you into giving away your personal information like a rogue antispyware program, it doesn’t mean it is completely harmless. For all its worth, LuckyShopper could get exploited by cyber criminals to promote their content. Although malware infection is in an extreme case of adware installation, you should take all the potential risks into consideration and remove LuckyShopper immediately. When you uninstall the application via Control Panel, you should scan your computer with a powerful antispyware tool because there is a high chance that there are more unwanted applications on board. Adware programs NEVER come alone, so you have to make sure that your computer is protected against any potential intruder. Select Uninstall a program and remove LuckyShopper. 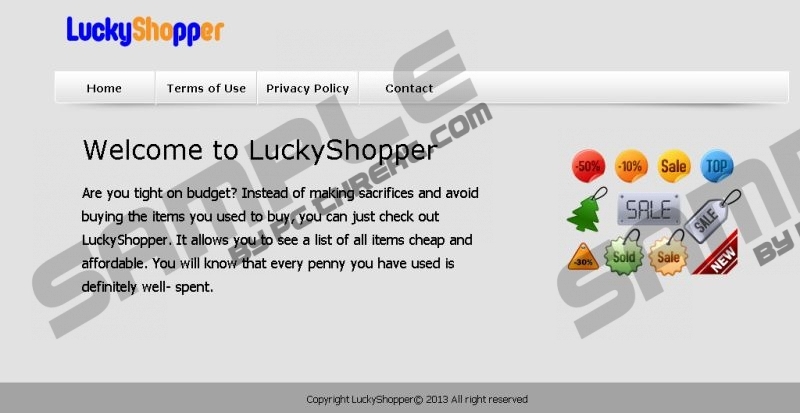 Go to Uninstall a program and remove LuckyShopper. Open Add or remove programs and uninstall LuckyShopper. Disable and remove LuckyShopper from Extensions. Remove LuckyShopper from the list. Quick & tested solution for LuckyShopper removal.